BMW just about has all their bases covered with the latest, updated BMW 1 Series. No station wagon is available; however the fun 1 Series Hatch should do the trick. If you need that extra bit of space, then the Hatch’s rear seats will fold flat to swallow plenty of cargo. A Coupe and Convertible finish off the basic design blueprint for what is an agile, good-looking BMW 1 Series. The BMW 1 Series is a great way to buy into the high-end Germanic brand, and the car provides such a fantastic driving experience. Each of the 1 Series models are rear-wheel drive machines that offer unsurpassed handling prowess and high levels of grip on the road. This is a car that can be pushed along through the corners at speeds other cars will be baulking at. Newly updated, you’ll enjoy the fresh lines and the 1 Series attractions. The compact design has plenty of sporty overtones in its bold appearance. Under the hood, you’ll discover plenty of choice. From the BMW 116i (100 kW, 220 Nm) to the torquey diesels – from the zippy 118i (125 kW, 250 Nm) to the storming 135i (225 kW, 400Nm) and 1 Series M (250 kW, 450 + 50 Nm) – there are plenty of engines to reliably entertain, whatever your budget. All the necessary luxury is onboard BMW’s smallest vehicle, and the BMW 1 Series has a very strong and stable passenger safety cage which gave it a five-star rating in Euro NCAP crash tests. Voice-control, Start/Stop engine management and brake energy reduction are notable new features. Back in the eighties, the BMW was the vehicle of choice for the successful businessperson/yuppie. Now that we’re well into the 21st century, many of us will be pleased to see that BMWs are, financially, within the reach of a wider range of people. BMW are still maintaining their standards of good looks and mechanical excellence, however buying a new BMW is a whole lot easier. The cheapest BMWs are the 1 Series models. It’s not a big car. 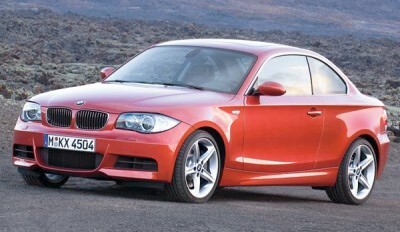 The BMW 1 Series has a length of 4360 mm, a width of 1748 mm and a height of 1408 mm. If you opt for the fast BMW 135i or BMW 1 Series M, then these two cars will be wider and slightly longer. The BMW 135i can cook the 0-100 km/h sprint in 5.6 seconds, while the BMW 1 Series M will smoke the same dash in 4.9 seconds! If you find yourself in any of the BMW 1 Series cars, you’ll be enjoying fun little vehicle that is cute enough to deserve the nickname “Baby Beemer”. The exterior styling of the BMW 1 Series has a hip, funky edge to it that should appeal to the younger market – or those young at heart – but still retain that unmistakeable stamp of BMW classiness. The fun factor of the BMW 1 series is trebled in the coupe and convertible versions. First seen at the 2008 Melbourne motor show, the little BMW Coupe harks back to the driving thrills experienced in the legendary BMW 2002 era. With a compact sedan body shape and two doors, BMW are on to a winner here. There is a BMW 1 Series to suit everybody, with a range of engine sizes, fuel types and body styles available. Coupes and Convertibles, five-doors and three-doors – they’re all there. And don’t forget transmission: the BMW 1 Series has both manual and automatic variants available. Essentially, a Sports Hatch, Coupe and Convertible are offered with a wide array of great engines to choose from. Common to all the variants within the BMW 1 Series range, apart from the good looks, are the rear- wheel-drive and the six-speed gearing system. BMW’s six-speed manual gearbox has the short-throw shifts and perfect ratios for superior engine and gearbox torque output. The optional six-speed automatic delivers smooth driving with exceptional response. Drivers who prefer a more hands-on approach can activate the auto-box to the Steptronic feature. Most importantly, in a small car like the BMW 1 Series, the safety features are common to all variants. Stability and safe stopping are guaranteed, with ABS, dynamic brake control, cornering brake control, automatic stability control, traction control, and dynamic stability (the 135i has DSC plus) and dynamic traction control all combining to ensure on-road safety. All five seatbelts are three-pointers, a feature found in most BMWs, not just the 1 Series. Front and side airbags in the front seats, and head airbags front and back are very welcome safety features in the BMW 1 Series – as is the DataDot technology. On the inside, the BMW 1 Series is capable of carrying four passengers plus the driver, but legroom is tighter in the back. Luggage space is not huge, however the carrying capacity can easily be increased by making use of the 60/40 split fold seats that are provided in all variants of the BMW 1 Series vehicles. A special cloth upholstery is complemented by a range of trims and colours. Leather upholstery is also available and can be set off by either aluminium Kodiak silver or brushed aluminium, and in some models you can enjoy front arm rests. Air conditioning, keyless entry and a CD/radio system are other ways that the BMW 1 Series sees to the convenience of the driver and passengers. To drive, the BMW 1 Series has been designed to stick to the road like a magnet, steer precisely and provide excellent ride comfort. Naturally, the BMW 1 Series has to offer “the ultimate driving experience”. It might be the “baby Beemer” but it handles as well as, if not better, than a number of the bigger models. While the BMW 1 Series won’t be first choice as a family car – other BMWs fill that role – it would certainly make a good choice as a second car, or for those driving alone or with one other person. For younger or older drivers, the BMW 1 Series would make a good choice that combines economy, fun, superb handling and good looks. For any more information on the BMW 1 Series, or for that matter any other new car, contact one of our friendly consultants on 1300 303 181. If you’d like some fleet discount pricing (yes even for private buyers! ), we can submit vehicle quote requests out to our national network of BMW dealers and come back with pricing within 24 hours. Private Fleet – car buying made easy!